Like the rest of us, Cully will never be redundant as long as there are loads of familiar faces to be recorded for Imdb. Plenty of work for everyone. Either side of Yul Brynner are Moira Lister (left) and Britt Ekland. Who is the girl in the pink dress? Nice pic of Pauline, cornershop. Re the lady in pink...Julia Arnall who is credited? 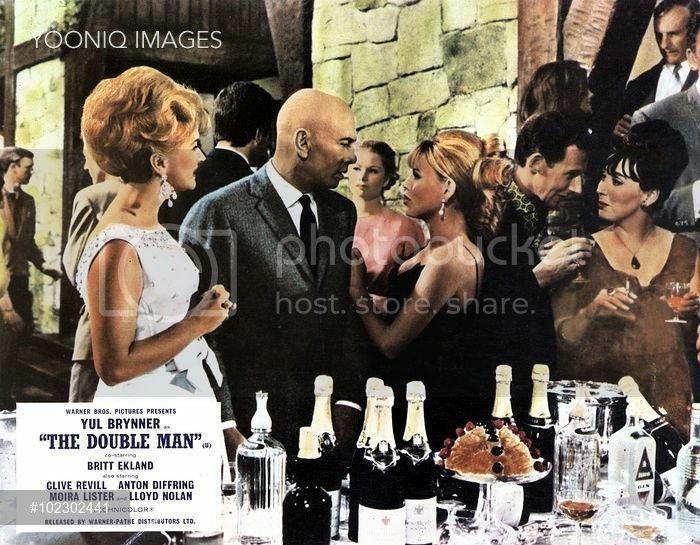 Here is a possible from 'Anastasia' - again with Yul Brynner. Anthony, some time back Pauline gave an interview to a Britmovie "Pauline" ( was it you?) giving a longish list of films she had been in which we had not confirmed for IMDB purposes. Was Anastasia one of those films, perhaps? Pauline is in Anastasia in the Tivoli Gardens scene, perhaps in other scenes too. Sorry, I'm clearly not awake. We already have Pauline in her role at IMDB...and I almost certainly posted the credit there! Member of staff at travel agency. Directed by Don Taylor. With Eve Arden, Roger Avon, Derek Bond, Cindy Carol. In this unsold pilot, Claudia Cooper, an American moves to London with her daughter to run a travel agency for a wealthy tycoon. Whilst looking for Guy Standeven in the awful sitcom Health and Efficiency (1995, Series 2, Episode 4, The Dope Peddler) I came across Pauline still sporting that classic beehive! Thank you, its the most recent picture of her (year wise that is) and possibly one of her final jobs as I'm sure someone said she retired round about this time. It truly is an abysmal sitcom by the way. Incredible that it got two series! You may be amused to learn that all 12 episodes are on YouTube. I've just watched one and I see what you mean. Good cast, though. Trigger plays a surgeon and Lynn from Alan Partridge a doctor. Yeah, that’s where I found it on YouTube. It is a great cast I agree but let down by a very poor script. On a different note was Pauline actually interviewed on the old site and if so does it still exist? Stonfan, I'm pretty sure an American member of the forum met and interviewed her a few years ago and the old lady added a whole load of new films to the ones we knew she had appeared in. I don't know where this thread is but a moderator like Mr Crook should know. See The old bulletin board archive can be found here…. Thank you, I was aware of the old site achieve but having been on it I can’t find an interview with Pauline. Just watched the Edgar Wallace B The 20,000 Kiss from 1963. In one of the nightclub scenes, in the far distance are a couple seated at a table, Although the image is tiny, it looks like our Pauline (same hair). We know Pauline was in at least two other Wallace's, but this one isn't on her Imdb resume. Can anyone confirm it's her? Paul Whitsun-Jones, Terry Sartain and Richard Thorp though.